Dril-Quip offers either Pull-Up or Push-Up style, riser tensioning systems which are designed for stroke lengths, tensioning capacities and riser angular offsets compatible with Spars and TLPs. Strokes up to 30 feet and tensioner capacities up to 4,000,000 lbs. 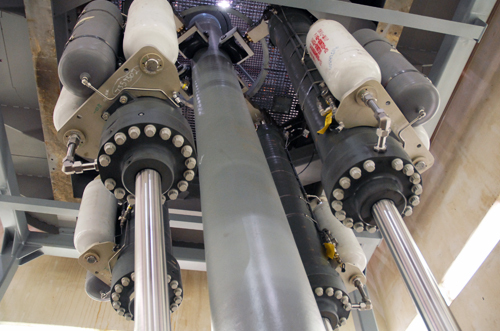 The heart of the tensioner system is the pull-up cylinder/accumulator assembly. The unitized assembly is comprised of a hydro-pneumatic cylinder, an external high-pressure accumulator, a low-pressure accumulator, and upper and lower-end connections.